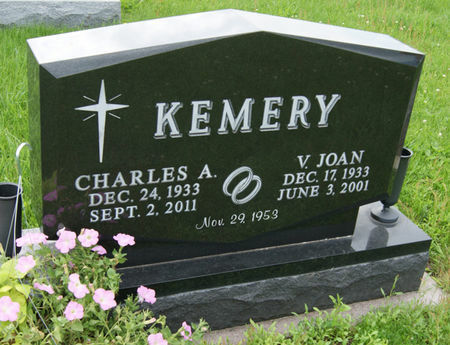 Charles Andrew Kemery, son of Karl Kemery and Effie Fitzhugh, was born Dec. 24, 1933 in Bedford, Taylor Co., Iowa and died Sept. 2, 2011 in Bedford, Taylor Co., Iowa. He married 1) Virginia Joan Brown Nov. 29, 1953 in Bedford, Taylor Co., Iowa and 2) Beverly Williams Thornton April 13, 2002 in Bedford, Taylor Co., Iowa. Virginia Joan Brown was born Dec. 17, 1933 in Clayton Twp., Taylor Co., Iowa, daughter of Harold Brown and Marvel Burns, and died June 3, 2001 in Kearney, Buffalo Co., Nebraska. Searching for VIRGINIA JOAN "JO" BROWN KEMERY in Taylor County Iowa?